LuckyStreak live blackjack ranks well against its competitors. They entered the live casino market place in 2014 and since then they have been growing and improving their range of live casino games. Although they don’t have a UK License yet (it’s coming), I’m able to access their live tables so I can test the games out and review them. I did some analysis for LuckyStreak shortly after they launched and recommended a number of changes that made their games more playable. A lot’s happened since then and I’m back to give the Live Blackjack a more detailed review. LuckyStreak live blackjack is immediately recognisable when you see it. It always strikes me how blue everything looks, although there has been a change recently and the studio now has a modern art deco design. The tables are larger than normal and so are the cards, which is good news for people like me who struggle to see small images onscreen. Anyway, onto a summary of the game. This is an 8 deck game played to Vegas rules. The shoe is changed approximately half way through and is shuffled away from the table. Before the next shoe is used there is a burn card procedure. The dealer withdraws the first card and whatever number that card is the dealer removes that number of cards from the front of the deck before dealing. You can split any like pair. Split Aces only get one card. You can double on any two cards including split hands. 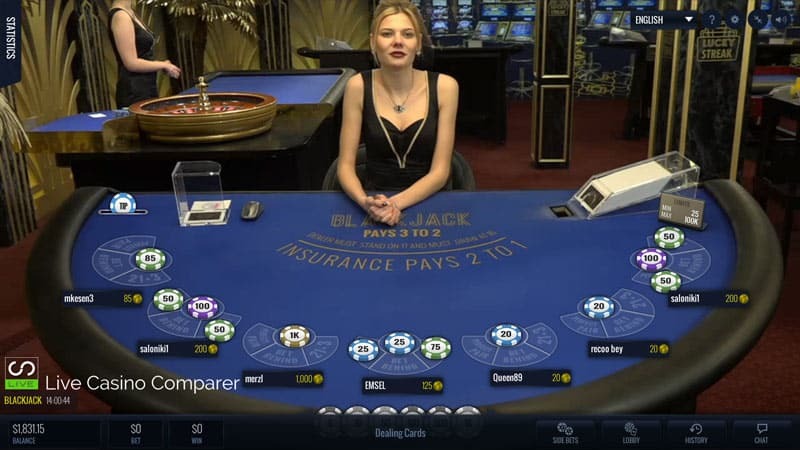 Blackjack Side bets of 21+3, Bet Behind and Perfect pairs can be played alongside the main hand. The Dealer doesn’t check for BJ when showing an Ace, although Insurance is offered and pays 2:1. There is only one viewing mode. The design of the playing interface is very good. Like other good interfaces, all the playing information can be hidden away so you get a view of just the table and the dealer. However, there are lots of options should you want to tailor the interface. Statistics are available and they show which players are hot and how many consecutive hands the have won. It’s a useful tool if you like playing Bet Behind and need to identify who’s playing well or getting the cards. Games Help? has a how to play guide and a full set of the rules. Video Quality can be adjusted between Low, Med, High and Auto. Only one view of the screen, no computer images. Sound Effects and the Win Animation can be toggled on / off. Screen size can be altered right up to Full Screen. The game sound can be adjusted. Hand histories can be displayed giving hand information for the past 24 hours. You can Chat with the dealer and you don’t have to be seated at the table to do so. The display of side bets on the table can be switched on / off. When you’ve played at as many live casinos as I have you can take for granted some of the good features you encounter. I’ve been caught out a number of times while playing at LuckyStreak simply because they place the decision-making buttons at the bottom of the screen or in the case of Pre-decision by your box position. I’m used to them being presented to me in the middle of the screen, both to remind me that it’s my turn and also so I don’t have to go fishing around for them. This is probably my only criticism of the playing interface. I guess if I played more regularly then I’d get used to it. You can play 3 Blackjack side bets. 21+3 which is the rummy side bet, Perfect Pairs and Bet Behind. Like Visionary iGaming Blackjack, Luckystreak only offers players a 9:1 payout on any winning Rummy Hands, which is way below the side bet payouts offered by other live casino providers. The Perfect Pairs and Bet Behind payouts are in line with industry standards. To speed up play Pre-decision is available on the table. You can select your first playing decision for your hand before it reaches your turn. If another decision is needed you make that using the buttons along the bottom of the screen. Disconnections are handled in a very basic way. If you’ve placed a bet and it’s accepted then the hand will play out. You’ll be dealt your two cards, the default action of stand will be applied to your hand. If you’ve not placed a bet you’ll lose your seat if you don’t reconnect in a short space of time. LuckyStreak Live Blackjack is so close to being the almost perfect game of Blackjack. They miss out because the dealer doesn’t peek for Blackjack when he’s showing an Ace. Ezugi and Visionary iGaming have marginally better rules. Otherwise, it’s a cracking game and should be high on your list if you love playing Blackjack. You can play LuckyStreak live blackjack at the following casinos.